We met a Tree Whisperer today — someone who can talk to trees and understand their needs and desires. 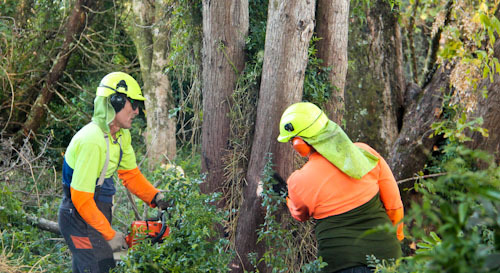 Roger Gale is a local legend, and it was an honour to see him at work as he cut down trees behind Johnny’s house. It's a pleasure to watch Roger at work. Roger's partner Jill works alongside him. Together they bring a special, peaceful attitude to what is usually a noisy, destructive line of work. After Roger cuts the base and knocks his wedges in, this particularly stubborn pine tree falls perfectly in the space between other established trees. Tired but triumphant, Roger respectfully acknowledges the tree that he has just felled. 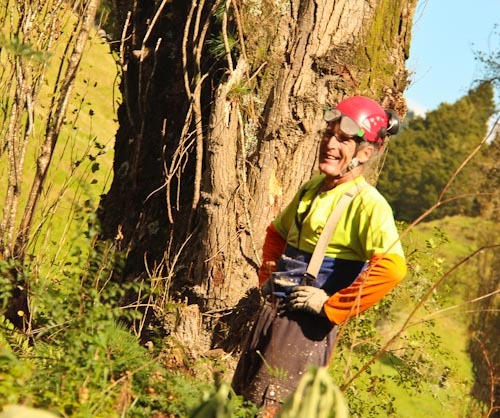 Roger is passionate about forestry and has transformed his own 35-hectare block of land from barren, farming country into a green oasis of native plants. He also guides visitors to the region on walks throughout the Far North. Roger’s website provides an interesting story written by one of the people who has accompanied him through the New Zealand bush. The only downside to today’s activity was Brioni’s anguish at the trees being felled. 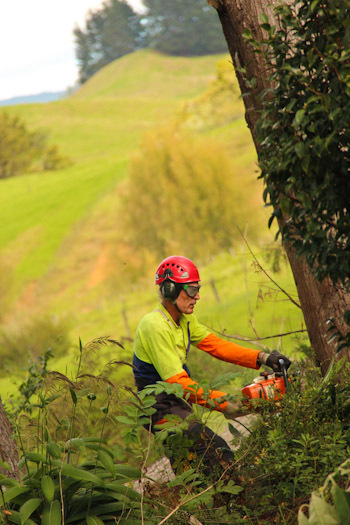 She didn’t mind the pine trees coming down, but when a gum tree was being cut, she wailed and burst into real tears. Brioni’s concern was for the fairies and Gum Nut Babies who live in gum trees and dress with the blossoms and nuts. Like you I feel a bit sad about the tree being cut down. I love trees and I love you. 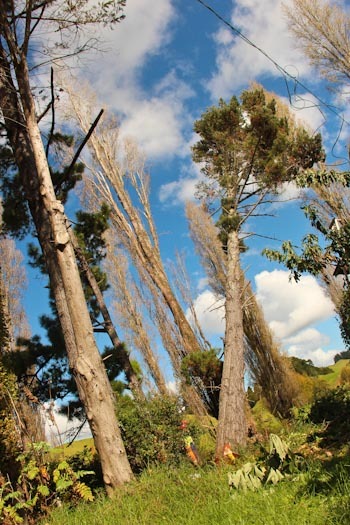 That photo of the pine tree falling is stunning – the colours and composition.